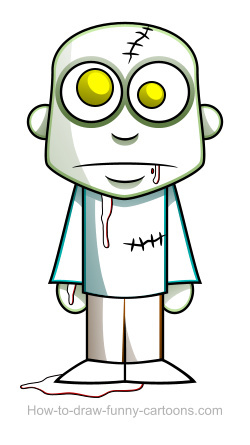 Zombie drawings are quite fun to create. All you need to do is basically draw a character with a green skin and add a few stitches, some blood or missing body parts. Might not be a fun thing to do if you don't like horror movies, but it's usually a fun experience. 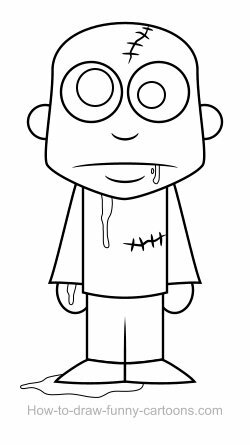 Of course since we are on a cartoon site, don't expect a drawing tutorial filled with realistic gory zombies. Instead, my goal was to create a fun cartoon character that could be enjoyed by anyone. First, you need to sketch the body of the character. 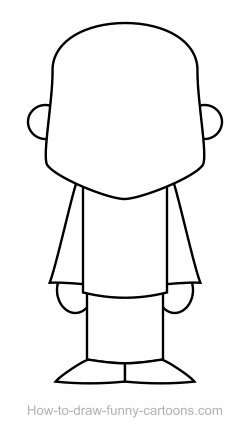 Draw a large head with a visible jaw and add two circles to illustrate the ears. Then, draw a thin body using a long rectangular shape. For the arms, you can also use a long and thin rectangular shape. The hands can be represented with two circles. No need to draw fingers ... we want to create a simple cartoon zombie. Finally, a large square can be used to form the legs. A line will be added later to separate both legs. Simple triangles are required to sketch the shoes. Let's move on to the next step to add more details on the illustration. Great! Now we need to add more details on the illustration. Draw two large circles to illustrate the eyes. For the pupils, two smaller circles can be added. You can also make one pupil smaller since we are drawing a zombie. For the nose, the mouth and the chin, a simple line is required. Adding stitches on the head and the body is also a good idea. You can make a gory character with missing body parts too if you feel like it. Zombie drawings are usually filled with blood. Adding just a few drops on the mouth, the shirt, the hand and the feet can be enough. Good! The drawing is a little bit boring, so let's add some colors. No need to create all sorts of complex effects for now. Only basic colors are required. The skin can be colored in green. Choose a color that is visible, but not too bright. Pupils can be colored in red, yellow or green. I think yellow is the best option. Red is too aggressive and green ... well, the zombie is already colored in green. For the blood, choose a tone of red that represents dried blood. For the shirt, the pants and the shoes, simply select colors that you are comfortable with. The goal is to have a result that is visually appealing and relevant with the character. Since we are working with a vector application (you are, right? ), select the gradient tool and add a second color on each solid shapes of the cartoon character. For example, you can add a darker version of the green color on the head. As you can see on your left, the illustration already looks more interesting. This simple effect is enough to give a little bit more depth on zombie drawings. All these effects can be done manually (with a good old pencil and piece of paper), but working with a vector software can speed up the process and give a cleaner result in the end (but cleaner doesn't mean better!). Great! Zombie drawings also need more effects to give emotions to the viewer. A simple thing that can be done to give more depth to the illustration is adding a few shadows manually by drawing additional solid shapes. Since we presume the light source is located on the right of the illustration, just add darker shapes on the left of the cartoon character. For example, a long dark shape can be drawn along the left side of the shirt. These new additions are important, but probably not as effective as they should be. Indeed, most of these shapes are simply too dark to create the desired effect. To polish our zombie drawings, we need to play with the opacity of the dark shapes created in the previous step. Although dark shapes might create a more dramatic result, softer shadows are often more appropriated. Each vector application comes with a tool that can help you play with the opacity of solid objects. Select this tool and partially hide the solid shapes used to represent shadows. Your goal is to make sure that each shape is darker on the left, but almost invisible on the right. Only shapes drawn around the eyes can be left slightly darker than the other shapes. 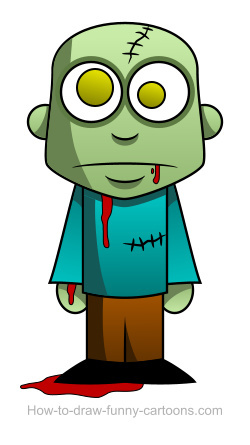 Creating dark areas on zombie drawings is crucial to enhance the cartoon characters. However, it's not the only thing that can be done to create a realistic illustration filled with depth and volume. Adding bright areas can also be a good idea. Indeed, lighting will create dark areas and shadows, but also areas that are covered by a brighter and more visible texture. To achieve this effect, simply duplicate most solid shapes from the cartoon zombie. Then, change the color to white and make sure that these shapes are slightly smaller than the original ones. Once again, to complete the desired effect, we need to play with the opacity of shapes created earlier. This time since the light is located on the right of the illustration, white shapes must be brighter on the right and almost invisible on the left. As you can see on the head, the left side of the white shape is almost completely hidden while the right side is more visible. It's another simple, but effective effect that can be added to any character you draw! Black outlines are great to draw a cartoon character, but using colors can create a more interesting result. To do so, simply change the outline's color of each shape using a similar tone of color used to fill the shape. For example, you can use a dark green color on the outline of the head, the hands and the ears. Once you are finished, you can also partially hide the stitches and add a little reflection of the shoes on the blood available on the ground. Great! I hope you will create more zombie drawings and don't hesitate to practice these techniques on all the characters you are working on!